How did the name Wild Fig come about? I would like to say there was a more interesting story behind the name but it really came from the traditional mind map and lots of musing. Figs are fabulously nutritious and a favourite foodstuff of my colleague Justin and myself but they also have a long, rich history and are represented in paintings through the ages, which I personally have a connection with. Above all, we wanted to develop and build a brand and the name Wild Fig just seemed to fit. How do you decide on your flavours? Ideas have come from a number of places. We place a great deal of time and importance on the flavour of all products that come from our kitchen and my colleague Justin’s experience and training is key for us in realising recipes and achieving that balance, depth of flavour and quality. We also are very keen to work with other Scottish producers creating beautiful crafted products, whether that be a premium Scotch whisky such as Glengoyne Cask Strength Single Malt,, matured in the finest casks and bottled as tradition insists from a distillery with the slowest stills in the country – or Dark Matter spiced rum, from the first and only rum distillery in Scotland. We continue to keep to the idea that ‘slowly, slowly wins the race’ – handmade, artisanal with a key focus on getting a beautiful balance of flavours from the kitchen to the table. From the ingredients we use to the time and experience that we invest in every jar. When I am out delivering tastings or selling at various events to consumers, each event has a different bestseller however the ‘Salt Caramel Sauce’ is consistently popular – perhaps it’s because it is such a hit with children and adults. Try it drizzled over their favourite desserts. For me, at the moment, it’s a tie between our latest products, the Tomato Chutney and ‘Single Malt Scotch Whisky, particularly delicious when paired with a hard cheese such as Scottish Mull Cheddar and the ‘Dark and Stormy Marmalade’ – delicious spread on warm sourdough bread. The ginger and dark brown sugar add a wonderful warmth and spice. 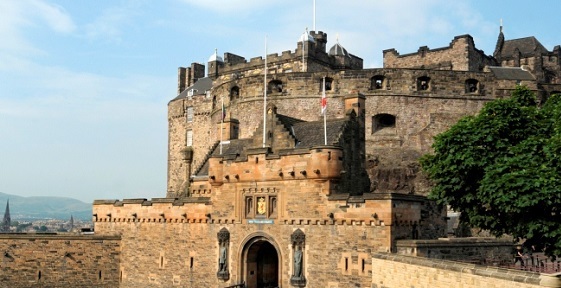 What products are currently at Edinburgh Castle? We are delighted that The Whisky and Finest Food Shop currently stocks our full range of 4 products. They sell some of the finest Scottish produce and to be represented here is just fantastic. Next time you are visiting the castle, stop by our Whisky Shop and check out Wild Fig’s wonderful range of products plus if you’re lucky there might even be a chance to have a taste!